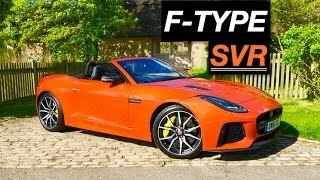 Jaguar brings the Jaguar F-TYPE SVR Convertible 2017 with enhanced feature and gestures in the F-type. It’s the model of the extreme version of the already popular sports car and its first to wear the high-performance SVR badge. The model is extremely sporty and dynamic with outstanding features. Jaguar is one of the world’s most superior brand and the most competitive when it comes to versatile vehicles. The model is superior in its line-up with glamorous gestures. 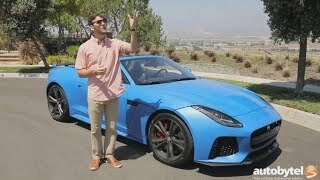 Let us have a close look at the reviews of the sporty beast Jaguar F-TYPE SVR Convertible 2017 and get to know more about the stuffs it holds. The interior of Jaguar F-TYPE SVR Convertible 2017 is glamorous to experience. It has upgraded features of the F-Type series. The luxury of the model starts with a three-spoke multifunction steering wheel wrapped in leather and adorned with anodized aluminum shift paddles. The seats are comfortable but supportive, and come with quilted leather and contrast stitching (a heating function is optional). It has ambient lighting color that is customizable, and the letters “SVR” can be found on the doorsill, headrests, and dark brushed aluminum paneling. It is aided with the features of Smart entry, a keyless pushbutton starter, and intelligent dual-zone climate control. There is a 770-watt sound system from Meridian, plus touchscreen operation, SiriusXM, and HD Radio. Jaguar InControl Apps connects your smartphone, while Jaguar InControl Protect offers emergency and breakdown services. Apple Watch users get to enjoy remote feature access like door locks, fuel level status, engine start, and cabin preconditioning. In all, the Jaguar F-TYPE SVR Convertible 2017 is enriched with top class interior feature. The exterior of the Jaguar F-TYPE SVR Convertible 2017 is a mixture of aggression and elegance. The front fascia of the SVR has a bigger mouth. Air drawn into the engine bay finds an exit through louvers in the hood, while side intakes cool the big brakes, venting to the skirts behind the fenders. There is a large splitter that juts out from the chin and under it, is flat underbody leading to a revised rear diffuser. The trunk of the car is large, the touring-car style wing is made from carbon fiber which extends more downforce and retracts for a higher top speed. The rear anti-roll bar has been thickened; the front anti-roll bar diameter has been reduced slightly. There is a active carbon fiber rear spoiler with carbon fiber roof panel. It has been upgraded with the highly optimized design which provides more effective and more aerodynamically-efficiency in both raised and lowered positions. So the Jaguar F-TYPE SVR Convertible 2017 is a complete package of stunning appearance. 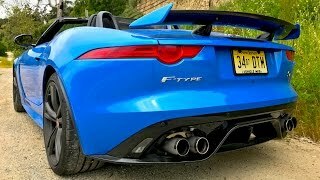 Jaguar F-TYPE SVR Convertible 2017 comes powered with the high performance V-8 engine. It offers the power of 575 hp and a peak torque of 700nm. The car can knock 0-60 mph in just 3.7 seconds and has a capability to attain the peak speed of 194 mph (200 mph in the coupe). A new lightweight Inconel titanium exhaust system has been fitted as standard which withstands higher peak temperatures, reduces backpressure and eliminates 35-lbs (16kg) of mass from the vehicle. 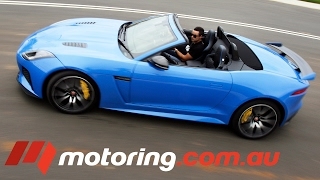 So, Jaguar F-TYPE SVR Convertible 2017 comes out to be a high performance vehicle.